Beautiful pedestal milk glass cake stand with rum well in Manhattan pattern. Very RARE, hard to find, gorgeous piece of Early American Pattern Glass. This cake stand measures about 6.75" tall and 9" wide. The area for the cake is 8.5 wide. The base is 4.5 wide. It is in good condition considering it's age. Four of the points around the bottom portion of the rim have very small chips around the bottom portion- very hard to notice. A fifth point has been chipped from under the rim, but is still not very obvious when the stand is right side up. See photos for details & please feel free to ask questions. Great piece to display wedding cake or gift for a milk glass collector. Manhattan was first introduced by United States Glass in 1902 in crystal and ruby stained, and was continued by Tiffin (originally a subsidiary of USG). This is USG #15078 and is also known as'New York'. 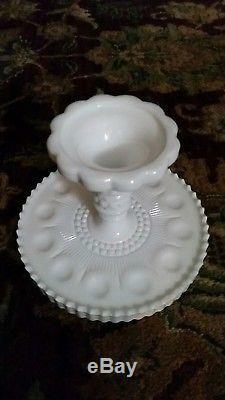 It is generally accepted that Tiffin Glass most likely produced this milk glass version The distinguishing characteristics of the Manhattan pattern are a horizontal row of bulls-eyes surrounded by beads, a series of vertical ribs resembling icicles, and bands of hexagonal blocks. The United States Glass Company in Pittsburgh, Pennsylvania began manufacturing the Manhattan pattern around 1902 in factories "G" and "P". The pattern line was given the number 15078. The item "RARE EAPG U. S Glass / Tiffin Manhattan Milk Glass Cake Stand 15078, Vintage" is in sale since Thursday, November 1, 2018. This item is in the category "Pottery & Glass\Glass\Glassware\Elegant\Tiffin". The seller is "geeklove1027" and is located in Monroeville, Pennsylvania.